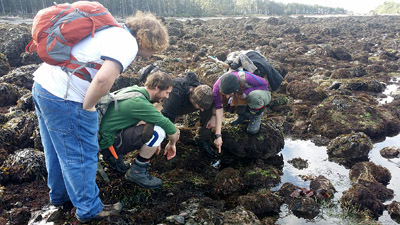 This week was full of amazing adventure as the Alderleaf Wilderness Certification Program headed out to the Olympic Peninsula to study coastal ecology and old growth forests. 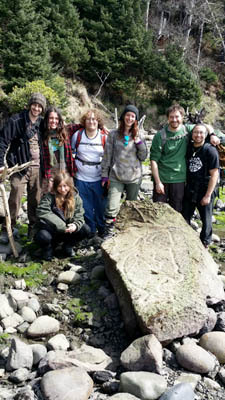 In the photo above, students were checking out tide pool life. You can see the rocks all around them are covered with a seaweed called Fucus, an important seaweed species they learned about on this field trip. Fucus, also called rockweed or bladderwrack, is a very interesting seaweed to get to know. It contains a mucilage inside each of its bladder-like pods. This mucilage can be used to soothe a sunburn, however it does not prevent sunburn. On each one of the pods you will see smaller bumps. If the bumps are not fully developed, hold it up to the light and you will see the little dots. Each one of those dots are segregated into either male sperm or female eggs. According to Dr. Ryan Drumm they are released only on the new and full moon, which is the highest and lowest tides. When they are released the females send out a scent that smells like gin. So if you go for a walk on a fucus filled beach during the new or full moon and smell gin, you can rest assured that you are not imagining it. 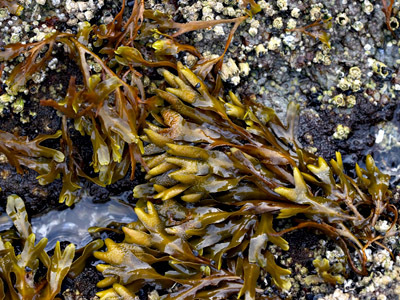 Fucus is just one of the many fascinating seaweeds that you can get to know. I highly recommend getting to know this group of algae as there are so many benefits that come from them. They can used as a source of both food and medicine. Fucus is considered to be a very healthy wild food as it contains vitamins, minerals, proteins and amino acids. 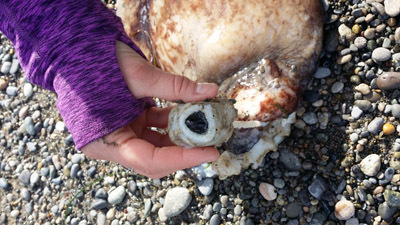 Megan, one of our students, found the beak of a pacific giant octopus, which is more common in our area than giant squid. Both the male and females die shortly after mating. However the female will live a little longer than the male in order to tend to their eggs. The females will lay around 200,000 eggs! 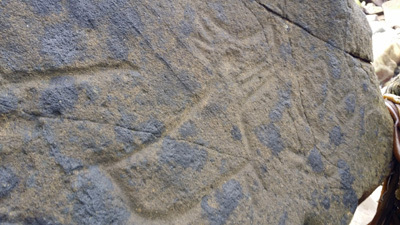 The petroglyphs were another highlight of visiting the coast. 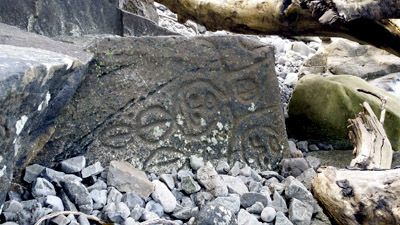 There were a few incredible pieces scattered on a small section of the beach. The privilege to witness the remains of stories and history recorded on the rocks is a special feeling that won’t soon leave our memories. We all had fun trying to figure out what the shapes and figures may have represented. This one is of a canine of some sort. The Makah raised dogs for their wool so naturally we wondered if this could possibly represent one of their wool-bearing dogs. 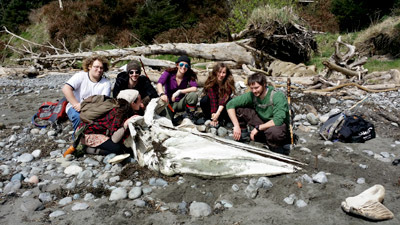 A whale skull was also sighted on our 10 mile hike on the coast. Inspecting such finds is part of learning about coastal ecology. We couldn’t have asked for better weather, the sun was shining and a gentle breeze was blowing. 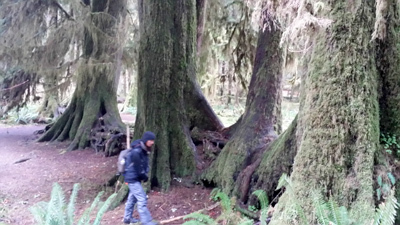 After two nights at Lake Ozette we headed over to the Hoh rainforest. Look at the pattern in which these giant trees grew. This line of trees is evidence of where they grew as seedlings. 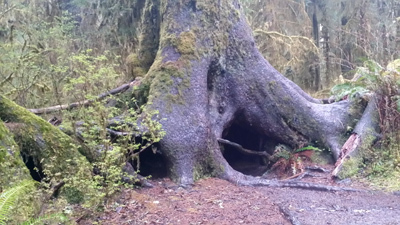 The nurse log that once supported their growth is now completely decayed and no longer visible. 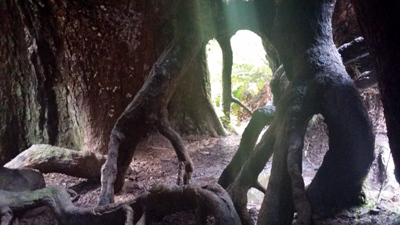 Because we were in an old growth forest, once the nurse log decays all the way, you are left with these amazing little hobbit houses made from the root systems that grew over the nurse log. 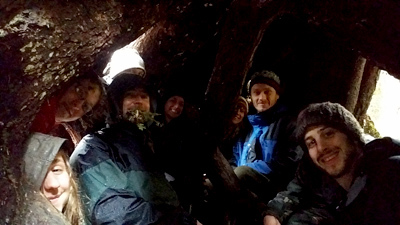 Left to right - Summer, Aaron, Terry, Megan, Georgie, Fil and Eric enjoyed having lunch in this magical place. This is the tree we were all hiding in. It's rooting system was incredible! 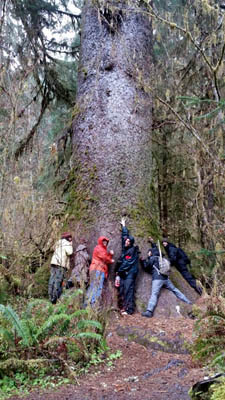 It took more than eight people to span around this magnificent spruce tree. 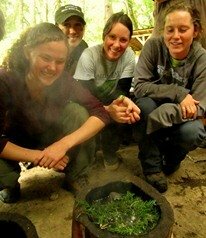 Not only did we enjoy the many plants and mosses of the rain forest, but the wildlife was incredible too. Elk herds roamed nearby and the deer didn’t seem to feel threatened by our presence. All in all it was an eventful week full of new sights and lessons.